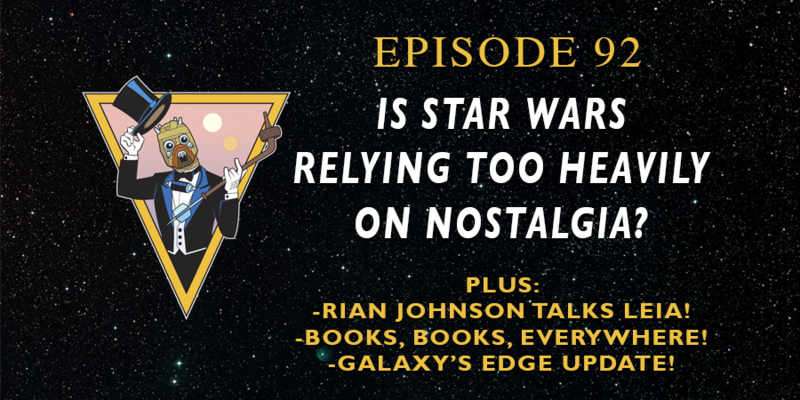 On this episode of Unmistakably Star Wars, Carl, Barb, Eve and Devin discuss the potential challenges of too much nostalgia. Plus, a look back at SDCC, Rian Johnson's comments on Carrie Fisher, and Star Wars: Galaxy's Edge. You can checkout the article we use as the base of our Closer Look discussion, here. Please be sure to also follow these fantastic Star Wars fans on Twitter: @MegZCull, @TheHeathShow, and @Otter272! Unmistakably Star Wars is an award-winning weekly podcast dedicated to promoting positivity in fandom. Please be sure to follow us on Twitter @UnmistakablySW, and feel free to contact us at UnmistakablyStarWars[at]gmail[dot]com, with questions, insights, or topic ideas for future shows! Episode 93: How Will Changes in Music Impact the Future of Star Wars?